Summary: The first spread in this companion book to Green shows a boy and puppy lying together with a blue blanket and the words “baby blue”. 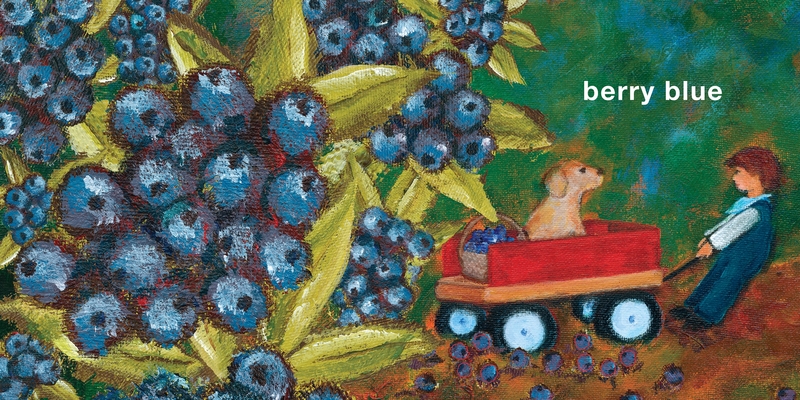 The two grow up together, first a preschooler pulling his dog in a wagon entitled “berry blue”, later an older boy walking his dog in the woods: “chilly blue”. At least a scrap of the blue blanket appears in every illustration, and a die-cut shape gives a peek to the next picture. Prepare for heartbreak on the pages “true blue”, “old blue”, and “so blue” as the boy deals with the aging and death of his beloved dog. There’s a wordless page where the boy meets a girl and her puppy, and the last page shows them grown up, walking hand-in-hand, while a dog frolics in the ocean: “new blue”. 40 pages; ages 3-7. Pros: I dismissively thought I had “gotten” this book after the first few pages, but the real power of it comes at the end. 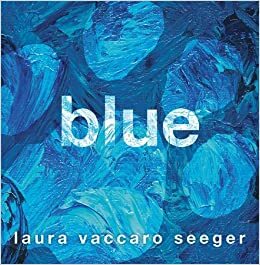 Seeger has already won two Caldecott medals, but the gorgeous acrylic illustrations so perfectly tell this touching story that it would be worth considering her for a third. Cons: Blue dies. I choked up just writing this review. Wow! This was a good one, and I choked up just reading your review. I love her books, and agree that there is so much packed into her minimal use of words. Beautiful, and I must have it!